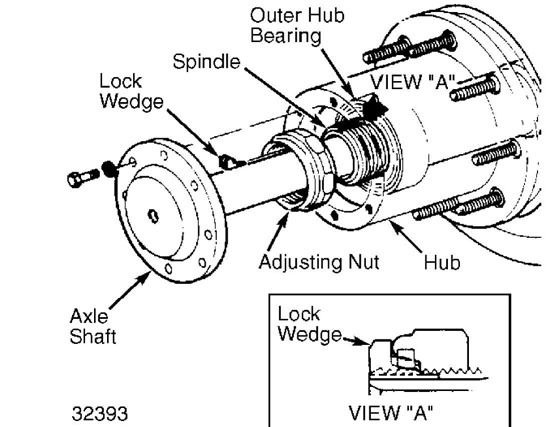 The axle assembly is an integral carrier type with hypoid gear ring and pinion. Stamped steel cover is removable for inspection and repair of differential. Vehicle loads are carried by axle housings. Axle shafts of "full-floating" rear assemblies may be removed without disturbing wheel bearings. 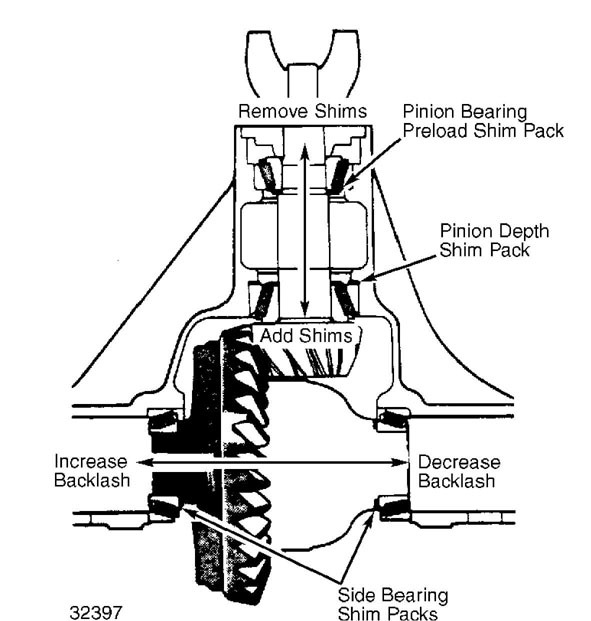 Drive pinion depth, pinion bearing preload and differential side bearing preload are all set by shims. See LOCKING HUB and 4WD STEERING KNUCKLE articles in this section for removal and installation procedures for these front drive axle component parts. A metal tag on axle is stamped with gear ratio, part numbers and limited slip identification. 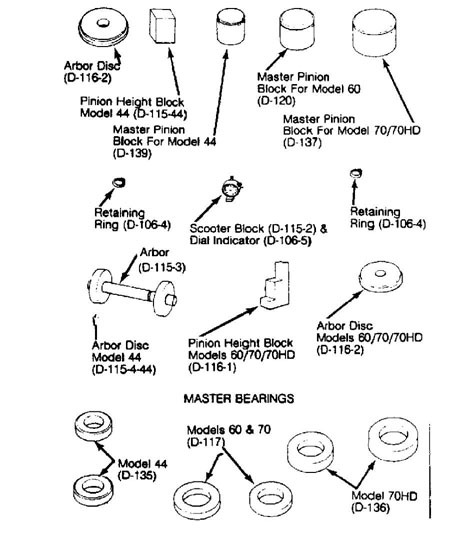 To determine drive axle ratio, refer to MODEL IDENTIFICATION BY RING GEAR SIZE table. (1) - While Rotating Hub. Raise and support vehicle. Remove tire and wheel assembly. 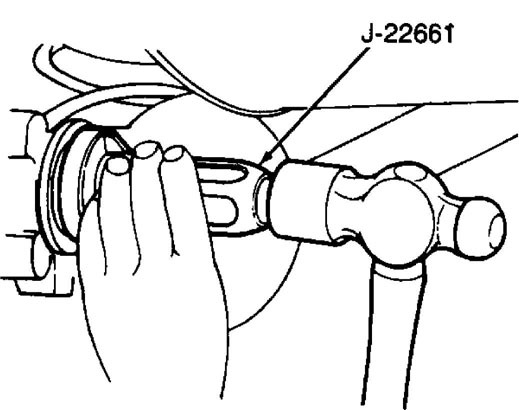 Remove disc brake caliper and support out of way. Match mark disc rotor and hub and remove disc rotor. Press hub out of bearings. Remove seals and bearings. Inspect bearings and races for wear and pitting. Replace bearing and race together. bearing hub. Install new seals. procedure. See TORQUE SPECIFICATIONS table at end of this article. Fig. 1: View Of Axle Disconnect Assembly Courtesy of Chrysler Motors. Remove axle assembly inspection cover and drain fluid. out end of axle tube. Remove shift collar. replacement of bearings or seal is necessary, use recommended tools. through seal and engage in drive axle splines. Install retaining clip. shaft and check for smooth operation of shift collar. To complete installation, reverse removal procedure. Tighten all bolts and nuts to specification. See TORQUE SPECIFICATIONS table at end of this article. AXLE SHAFT in this article. 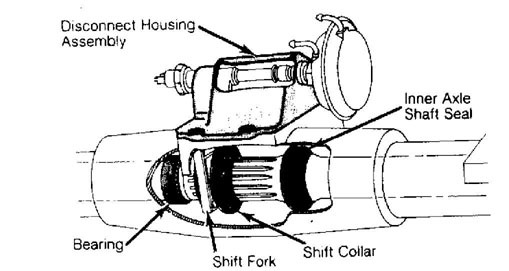 shift motor. 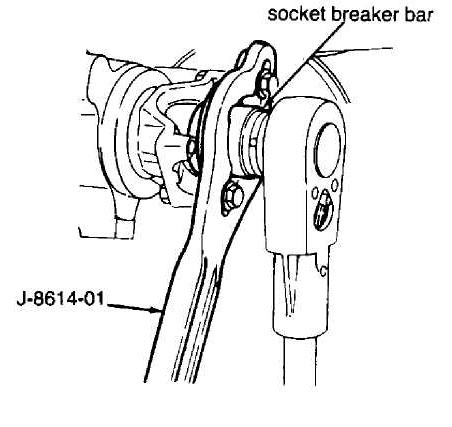 Disconnect stabilizer bar, track bar and steering damper. Disconnect drive shaft at pinion yoke and tie to frame. Remove left and right tie rod ends from knuckles. vehicle. Install coil springs and raise assembly into position. Ensure top of coil springs seat in spring pocket. dowels and pull axle shaft out of hub. bearing adjusting nut(s) and remove hub assembly. or dent race. Ensure new race is seated in hub. Pack bearings with multi-purpose grease. Install new seal. 6) Install new axle flange gasket or apply silicone sealer. Install axle and tighten bolts or nuts to proper specification. See TORQUE SPECIFICATIONS table at end of this article. Raise and support vehicle. Remove wheels, hubs and axles. See REAR HUB, BEARINGS AND AXLE SHAFTS. Remove lower shock mounts and stabilizer bar mount. wheel cylinders or calipers. Remove brake backing plate or caliper. Place axle housing on floor jack. Raise axle and install "U" bolts and nuts. To complete installation, reverse removal procedure. Tighten all bolts and nuts to specification. See TORQUE SPECIFICATIONS table at the end of this article and REAR HUB BEARING ADJUSTING SPECIFICATIONS table. 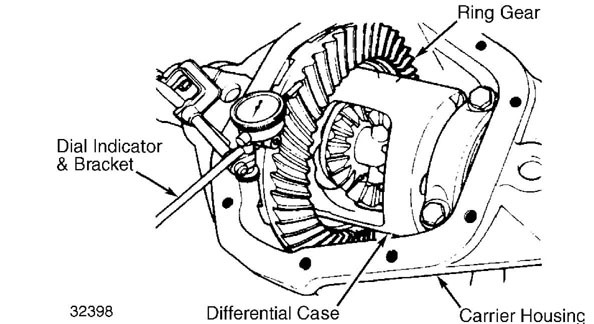 differential housing. See Fig. 5. Using Seal Installer (J22661), drive new seal into front differential housing. See Fig. 6. Tighten yoke attaching nut to 210 ft. lbs. (285 N.m). Using NEW strap bolts, align and install drive shaft. Tighten strap bolts to 14 ft. lbs. (19 N.m). Fill differential with SAE 75W-90 gear lubricant. NOTE: All front axle shafts except (Select-Trac) use Cardan "U"
joints and should be overhauled in same manner as drive shaft "U" joints. out far enough to remove first ball bearing. Remove remaining ball bearings in same manner. spacer ring and outer boot. Fig. 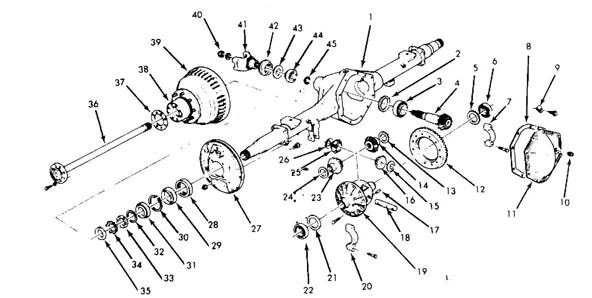 7: Exploded View of Jeep (Select-Trac) Drive Axle Courtesy of Chrysler Motors. Inspect all 6 balls for pitting, cracking or scoring. normal and DO NOT require joint replacement. opposite of removal. Inner race snap ring should face axle side. cage and inner race into installed position. of seal) with CV grease. Slide seal retainer on end of seal. may have been turning in carrier. If race has been turning, carrier could be damaged. Model 44; D-167 on Models 60, 61, 70 and housing to .015" (.38 mm). See Fig. 9. CAUTION: DO NOT spread housing more than .020" (.51 mm). Permanent damage to housing could result. shims. Be careful not to damage machined surfaces of housing. discard. Tap ring gear loose with soft mallet. If ring gear runout measured earlier exceeded .006" (.15 mm), repeat runout measurement of case without ring gear. Total runout of case should not exceed .003" (.08 mm). 60 and 61; DD-914-95 on Models 70 and 80) . NOTE: Pinion bearing adjusting shims may remain on pinion shaft, stick to bearing or fall loose. Collect and save them for reassembly. Extension Plug (C-293-3 on Model 44; DD-914-7 on Models 60, 61, 70 and 80) and Puller Plates (C-293-18 on Model 44; DD-914-62 on Models 60, 61, 70 and 80). Record shim thickness and location for reassembly reference. pinion shaft, gears and thrust washers (one for each gear). differential case halves to aid reassembly in correct position. Remove bolts holding case halves together. Tap on top half of case to break it loose from lower half. Remove top half of case. Remove pinion gear spider, pinion gears, side gears and all thrust washers. backlash between ring and pinion must be adjusted. selected for new pinion shaft depth adjustment. NOTE: In order to use PINION DEPTH SHIM ADJUSTMENT SPECS table, old pinion shaft shim pack dimensions MUST be determined accurately. If original pinion shaft shim pack dimension cannot be determined accurately, Pinion Depth Gauge Set (D-271) must be used to properly determine pinion depth setting. Depth gauge set must also be used if new carrier housing is to be used. 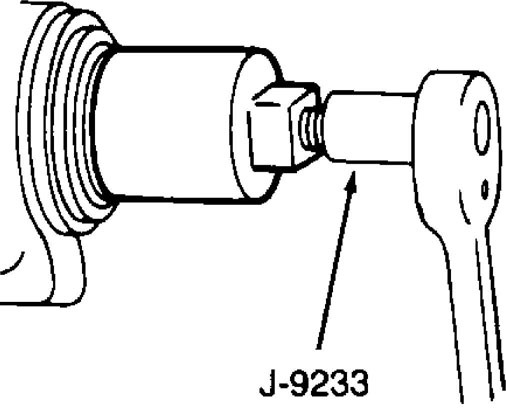 3) The pinion depth adjustment number is determined by manufacturer at time of assembly. 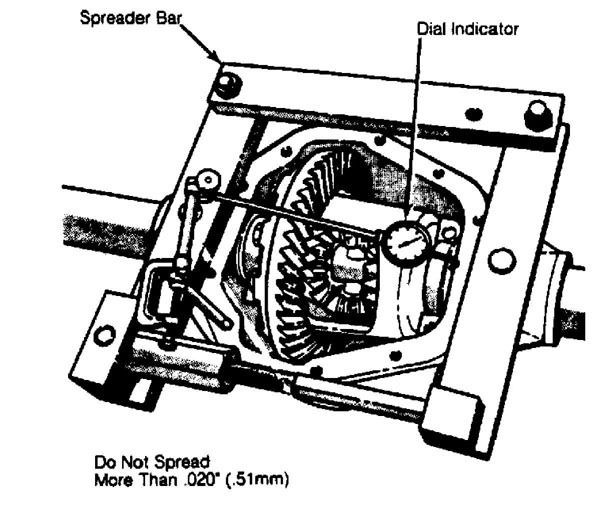 Number represents distance best running position of pinion shaft deviates from "nominal" or standard distance between pinion gear face and center line of axle. See Fig. 11. NOTE: Dimensions for Models 44, 61 and 80 not available. face of pinion shaft. 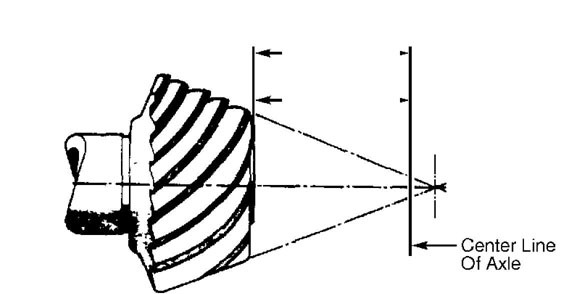 Deviations are noted on pinion face. 4) Pinion Depth Gauge Set (D-271) allows shim pack adjustments to be made without having to remove and replace differential bearings. See Fig. 12. NOTE: This set can be used on Models 44, 60, 61, 70 and 80. 5) Place differential case in holding fixture or vise. Lubricate all parts with gear oil. On one-piece case, place side gears and new thrust washers in case. Place differential pinions and new thrust washers in case. Rotate side gears until holes in pinion gears and washers line up with holes in case. Install differential pinion shaft. Install lock pin after aligning hole in shaft with hole in case. Peen edge of hole to keep pin in place. to 65-70 ft. lbs. (88-95 N.m). gear bolts evenly in alternating pattern to specification. against back of ring gear. clearance between case and side bearing races. If new differential side and pinion gears are used with new washers, gear backlash should be correct due to close machine tolerances. If old gears and/or washers are used, gear backlash must be checked. NOTE: If original ring and pinion is to be used, measure old shim packs and make up packs of same dimensions with new shims. Baffles are considered part of shim pack. Depth Gauge Set (D-271) is used to determine pinion depth. carrier with discs riding in bearing bore. scooter block flat on pinion height block. 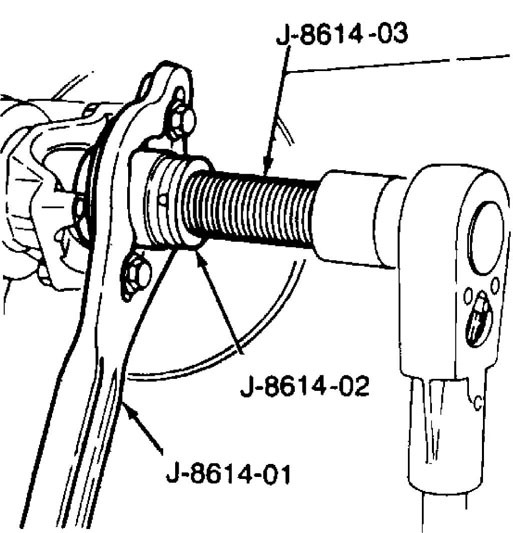 Move scooter block so dial indicator tip touches arbor. thickness of shim pack necessary for pinion bearing. Block (D81T-4020-F56) to determine required thickness of shim pack. On all models, measure shims separately with micrometer. inner pinion bearing onto pinion shaft using Press Tube (C-3095-A). outer bearing, slinger (if equipped), flange, washer and nut. NOTE: Pinion preload shims and oil seal should NOT be installed at this time. pinion height block on face of pinion shaft. etching on pinion face, pinion depth is correct. NOTE: If pinion depth is not with .002" (.05 mm) of etched number on face of pinion, shim pack under inner bearing race must be changed before proceeding with differential settings. bearing. Place preload shims (removed during disassembly) on pinion. table at end of this article. keep pinion shaft turning freely and smoothly should be 20-40 INCH lbs. (2.3-4.5 N.m). If preload needs to be increased, remove a few shims and recheck. To decrease preload, add a few shims and recheck. See Fig. 14.
on case. Set up dial indicator in same position as when case end play was checked. See Fig. 13. Press ring gear toward pinion head while rocking ring gear so teeth mesh fully. 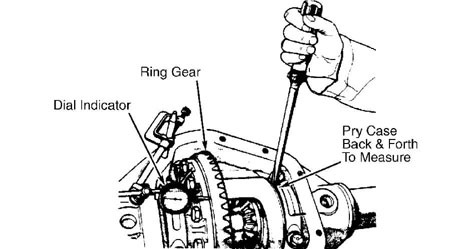 Zero dial indicator while holding ring gear into pinion gear. Press differential case (ring gear) away from pinion gear. Put calculated shim pack on hub of case at ring gear side. (C-4171) to drive bearing onto case until it is seated. Take remaining shim pack as determined from case end play measurement and install pack on opposite side of case from ring gear. onto side bearings. Install differential case into carrier. 1) Install side bearing caps, making sure reference marks made on caps and carrier match. Tighten cap bolts to 80 ft. lbs. (108 N.m). Check backlash between ring and pinion gears at 3 points spaced equal distance on ring gear. See Fig. 15.
closer to pinion gear. If backlash is too low, move ring gear away from pinion gear. install new cover gasket and cover. Tighten cover bolts to 30-40 ft.
lbs. (41-54 N.m). Fill assembly with hypoid lubricant.